Marvel’s Steve Ditko, Co-Creator of Spider-Man and Doctor Strange, Dead at 90Beyond his two most well-known superheroes, Ditko created or co-created Squirrel Girl, Mr. A, the Question and Captain Atom. Marvel’s Cloak and Dagger Is the Superhero Show of the SummerIt’s an unparalleled blend of the naturalistic and the surreal. Wolverine: The Long Night Is a Bold Experiment for MarvelWe’ll see where the Marvel podcast goes, but it’s off to a very promising start. Marvel Comics Announces ‘Fresh Start’ for Its SuperheroesBut will it represent real change? Method Man Wrote a Ghost Rider Christmas ComicGhost Rider takes on Krampus. Who Is Agent Carter? A Brief History of the Marvel HeroineFrom comics zero to TV hero. 5 Things to Know About Apocalypse, the New X-Men Movie VillainHe’ll be played by Oscar Isaac. Fox & Friends Really Doesn’t Like the New Black Captain America“Ordinary Americans” are under attack from Marvel Comics. Marvel is Developing a Damage Control SitcomThey’re the crew that cleans up after superheroes have destroyed the city. That Time the Avengers Battled ScientologyAmazingly, Marvel Comics didn’t get sued! Jason Momoa Is Trying to Ignite a Goddamn Nerd WarAccording to a fan at Indiana Comic-Con. Who Is Vision, and Why Should You Care?Nice to see you, Vision. Marvel Made a Darth Vader Comic, and It’s Surprisingly FunWriter Kieron Gillen is doing a helluva job. Exclusive: Dinosaurs Battle Biplanes in Garth Ennis Marvel Comics SeriesThe legendary comics scribe is doing a Secret Wars tie-in. Daredevil Trailer Brings Marvel Back to Its Roots: New York CityThe spirit of ’60s Marvel is reborn. Here’s Why Superhero Fans Are Losing Their Minds Right NowMarvel movies are going to the promised land. It’s Tragic and Disappointing That Marvel Is Canceling Fantastic FourIt was likely due to petty film-licensing squabbles. Here’s Who Rosario Dawson’s Playing in DaredevilShe’s sort of playing two characters. See the First Comics Appearance of the Female ThorAnd the first three pages of the comic, too! Grant Morrison’s Lost Miracleman Comic Is ComingFirst new Miracleman stories in 20 years! Comics Star Ales Kot Talks Bucky Barnes, GhostsAnd we have exclusive pages from his upcoming Winter Soldier series! Donald Glover Is Going to Play Spider-Man (in a Cartoon, But Still)Baby steps. Marvel Universe Live! 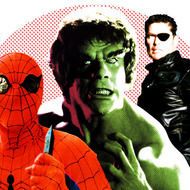 Is Silly and FascinatingWhy Marvel geeks should pay attention to this weird spectacle. Please, Sony, Don’t Let Your Spider-Man Spinoff Be a Black Cat MovieThe rumored Black Cat movie would be a step back for women. Everything You Need to Know About ThanosA deep-dive into the space villain’s 40-year comics history. Where Did the Guardians of the Galaxy Come From?Meet Rocket Raccoon, Groot, Gamora, Star-Lord, and Drax the Destroyer. Why Does Spider-Man Keep Getting Arrested?It all makes sense if you read the comics and look at price tags. Marvel Is Making a Female ThorAnd they announced it on The View. Alan Moore’s Lost Comic Miracleman Has ReturnedIt’s the greatest comic you’ve never read. The Legacy of X-Men’s ‘Days of Future Past’The origins of a revolutionary story arc. Weirdest Debate in Spider-Man History Rages OnA tale of backstabbing and physics. Why Captain America Is Only Interesting If He’s a PrickIt’s been done before. And it’s amazing. Meet G. Willow Wilson, the Muslim Woman Revolutionizing Superhero ComicsShe’s G. Willow Wilson, the writer of Ms. Marvel. There Are No White Men in the Reboot of Major Marvel Comics Super-TeamGood job. Marvel’s Diversity Issue: Screen Output Doesn’t Reflect Open-minded ComicsIf you judged solely by the big-budget movie and TV adaptations, you’d have no idea how accepting the source material is right now. Live-Action Marvel TV Shows Before Agents of S.H.I.E.L.D.Jessica Walter as a witch! Thor as a beach babe! Mutants in the grunge era! Five Ways The Amazing Spider-Man Differs From the Previous FilmsIt’s arguable that this latest web-slinging film contradicts its own Hollywood canon more than any other superhero reboot. Disney Digging Deep into Marvel Comics Backcatalog Ever heard of Big Hero 6? The Avengers Rakes in $80.5 Million on Second Biggest Opening Day EverThe Hunger Games opened with “only” $68 million.